Right Royal Romantic Reunions (a Valentine story that is complete fiction) …. 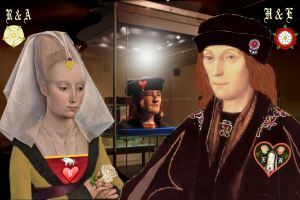 St Valentine’s Day in Leicester was all wind, rain and freezing cold temperatures, but the weather had not deterred the many people who had come to the King Richard III Visitor Centre. They were eager to see the exhibition about the man who had died in battle at nearby Bosworth in 1485, was lost for over five hundred years, and then found again, to be buried in 2015 in Leicester’s cathedral.